PAY2DAY boasts an innovative approach to the Alternative Financial Services business specializing in PAYDAY LOANS and CHEQUE CASHING. 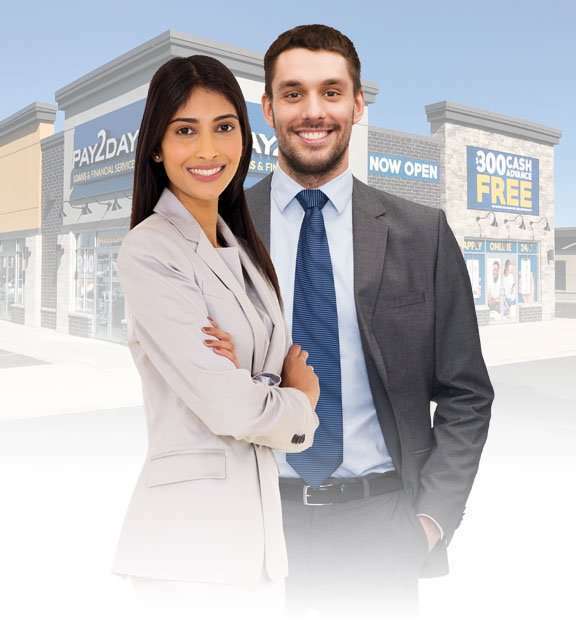 As part of our dynamic team, our franchisees have complete operational support, including full in-depth training, expert assistance with site selection, advertising/marketing support, as well as the benefit of a corporate management team of knowledgeable experts with over 15 years of experience in the payday loans and cheque cashing industry. PAY2DAY began in 2006 offering small loans through on-line internet lending, providing a fast, friendly convenient way of securing an advance without leaving your home or office. The need for our services grew and in 2008, we opened our first storefront location to serve our clientele in a more personal way. PAY2DAY now has multiple locations in Ontario with more opening soon. PAY2DAY is a profitable alternative retail financial services company with multiple locations available throughout Canada. Contact us to find out how you can be the next successful PAY2DAY franchisee! Why Choose PAY2DAY for Your Franchise? We are experts in the field of payday loans and cheque cashing. We have extensive experience with site selection and opening locations in various provinces across Canada. Our in-depth knowledge of individual markets means we will be selecting proven areas likely to produce results. We are experts in the field of payday loans and cheque cashing. Highly effective digital, print and seasonal marketing efforts. We offer several other financial related services including cheque cashing. Our knowledgeable staff is able to not only meet, but exceed clients’ expectations.